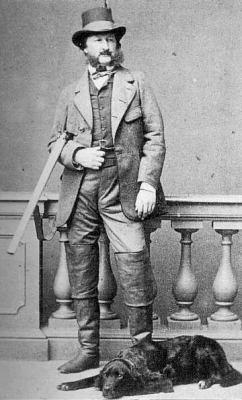 Ferdinand II August Prinz von Sachsen-Coburg-Saalfeld was born on 29 October 1816 at Vienna, AustriaG. He was the son of Ferdinand Georg August Prinz von Sachsen-Coburg-Saalfeld and Marie Antoinette Kohary of Csabrag.1 He married, firstly, Maria da Glória de Bragança, Rainha de Portugal, daughter of Dom Pedro IV de Bragança, Rei de Portugal and Maria Leopoldine Erzherzogin von Österreich, on 9 April 1836 at Lisbon, PortugalG. He married, secondly, Elise Frederica Hensler, Countess of Edla on 10 June 1869 at Lisbon, PortugalG, in a morganatic marriage. He died on 15 December 1885 at age 69 at Lisbon, PortugalG. 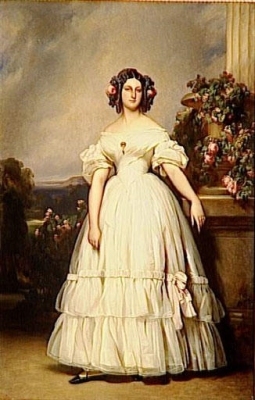 Maria da Glória de Bragança, Rainha de Portugal was born on 4 April 1819 at Rio de Janeiro, BrazilG. 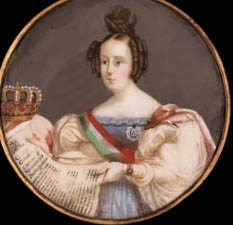 She was the daughter of Dom Pedro IV de Bragança, Rei de Portugal and Maria Leopoldine Erzherzogin von Österreich.3,4 She married, firstly, August Herzog von Leuchtenberg on 26 January 1835 at Lisbon, PortugalG. She married, secondly, Ferdinand II August Prinz von Sachsen-Coburg-Saalfeld, son of Ferdinand Georg August Prinz von Sachsen-Coburg-Saalfeld and Marie Antoinette Kohary of Csabrag, on 9 April 1836 at Lisbon, PortugalG. She died on 15 November 1853 at age 34 at Lisbon, PortugalG. [S16] Jirí Louda and Michael MacLagan, Lines of Succession: Heraldry of the Royal Families of Europe, 2nd edition (London, U.K.: Little, Brown and Company, 1999), table 42. Hereinafter cited as Lines of Succession. [S12] C. Arnold McNaughton, The Book of Kings: A Royal Genealogy, in 3 volumes (London, U.K.: Garnstone Press, 1973), volume 1, page 282. Hereinafter cited as The Book of Kings. [S12] C. Arnold McNaughton, The Book of Kings: A Royal Genealogy, in 3 volumes (London, U.K.: Garnstone Press, 1973), volume 1, page 389. Hereinafter cited as The Book of Kings. [S12] C. Arnold McNaughton, The Book of Kings: A Royal Genealogy, in 3 volumes (London, U.K.: Garnstone Press, 1973), volume 1, page 168. Hereinafter cited as The Book of Kings.